As promised we want to speed up our release process. Today we want to release a minor update that fixes some bugs that were encountered in EV0001, so this is basicly EV0002 and provides some additional features. If you don’t want to read about the changes you can grab the program directly in our download section. The Player is still not suitable for daily use, please report any bugs you encounter in games so we can make it better. Thanks! In our ongoing approach to port the EasyRPG Player to highly important platforms we want to provide a glance at our newest port supporting Windows 98. In 2012 the market share of Windows 98, 2000 and NT together was an incredible high value of 0.13% so a port was totally worth it. The hardware and software requirements of the application are minimal. You only need an Intel Pentium 2 or newer or an AMD K6 or newer. Operating system: Any Windows since Windows 98. Player was run on a 350 Mhz Pentium II system. 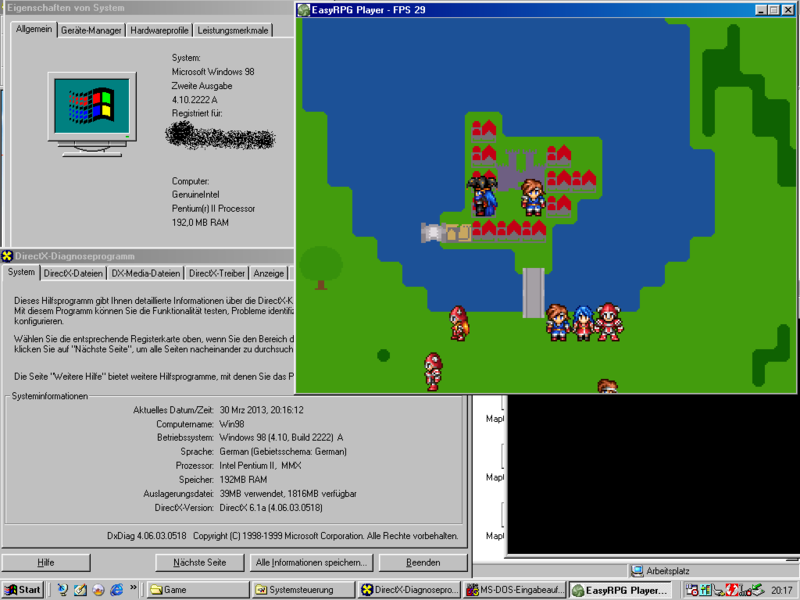 With resolution 640×480 the test map runs at 30 FPS, with 320×240 at 60 FPS. The strange chipset is our placeholder chipset until somebody draws a new one for us (maybe you?). We render at 32bit, the output quality is improved compared to RPG_RT on color intensive scenes but our feature that allows playing of games from other countries (e.g. Japanese) on a european Windows is gone because of operating system limitations (limited Unicode support). And something completly different: The Wii nightly build is back and 0.1 builds for Caanoo and Pandora (thx Rikku and Kazuki) were contributed.